Liverpool moved top of the Premier League thanks to a 4-0 victory away to Bournemouth. The game saw Muhammad Salah strike his first treble of the season and Steven Cook scoring an own goal. For Man City who has led the way for the better part of the season, they lost 2-0 at Chelsea. Ngolo Kante put the Blues ahead on 44 minutes before David Luiz sealed the victory late on in the game. At the Emirates Stadium, Arsenal scrapped to a 1-0 win over a spirited Huddersfield Town side. Lucas Torreira scored the only goal off an acrobatic-kick, six minutes from time. Victory keeps Arsenal fifth on the log, level on points with Chelsea who remain fourth. At Old Trafford, Man United registered their biggest victory in the league this season to climb into 5th on the table. Jose Mourinho’s side ran out 4-1 victors over ten-man Fulham with the goals coming from Juan Mata, Marcus Rashford, Ashley Young and Romelu Lukaku. In the late-kick off on Saturday, Harry Kane-less, Tottenham defeated Leicester City 2-0 at the King Power Stadium. Son Heung Min and Dele Ali struck the goals for Pochettino’s side. Elsewhere, Wolves, West Ham, Cardiff and Burnely registered big wins in their quest to fend off the relegation dog-fight. Here are the IX players who stood-out for me in Game Week 16. Another weekend after which i struggle to find a keeper for my team of the week. But i will settle with Liverpool’s Alison who once again registered a clean sheet as his side moved top of the League after a 4-0 demolition of Bournemouth. The Brazilian has now gone 16 League games since his debut minus tasting defeat, the most by a Kop at the start of their career. The Irishman struck in the 90th minute as his Wolves side won 2-1 away to Newcastle on Sunday evening. He has scored three goals already this season, more than any other defender i the division. One of the most underrated defenders in the Premier League. Tarkowski scored the winner and was at his absolute best as Burnely defeated Brighton 1-0 on Saturday. Just days after doubts were starting to be raised about Luiz’s role at the heart of Chelsea’s defence, the Brazilian comes up with a masterpiece of sorts against the best team in the land. Luiz not only defended with his life but also scored the second as his side defeated Man City 2-0 on Saturday evening. LB. Ashley Young (Man United). Young scored and assisted in the same Premier League game as United defeated Fulham 4-1 on Saturday. It was the first time since April 2015 that the Englishman had achieved the fate. An acrobatic volley brought victory against Huddersfield and was what the Uruguayan deserved after another all-action display. Kante scored with his only shot against Manchester City, and no Chelsea player created more chances than him. I think on Saturday, Kante played his best football in the advanced role under Maurico Sarri. MF. Juan Mata (Man United). Mata is only the third Spanish player to both score 50+ goals and register 50+ assists in Premier League history after Cesc Fabregas and David Silva. He reached both milestones in the game at home to Fulham on Saturday. FW. Marcus Rashford (Man United). 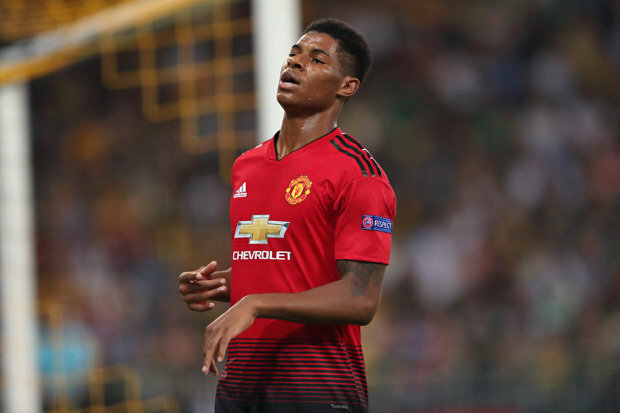 Rashford was involved in three goals in a Premier League match for the first time since February 2016 against Arsenal – his debut in the competition. The young Englishman set up both Ashley Young and Juan Mata before completing the route with a superb shot from out-side the area in the 4-1 win over Fulham. FW. Son Hueing Min (Tottenham). Salah has scored the opening goal in more Premier League games than any other player this season (seven).On Saturday, the Egyptian not only scored the opener against Bournemouth but registered his first Hat-trick of the season.